Considered Russia's last true autocrat, Alexander III was the epitome of what a Russian Tsar was supposed to be. Forceful, formidable, fiercely patriotic, and at 6' 4" towered over his fellow countrymen. He was the embodiment of the fabled Russian bear. He came to power at a critical point in Imperial Russian history. The Industrial Revolution had finally come to Russia and capitalism was taking root. Foreign investment within the country was at an all time high. His Father, Alexander II was within hours of granting the country its first constitution. Ironically, Alexander III was not born heir to the Russian throne. Born in St Petersburg on February 26, 1845 (old style), he was the second son of Alexander II, the "Tsar Liberator" who had freed the serfs. His older brother and heir to the throne, Nicholas, died in 1865. The young Grand Duke was greatly influenced by his tutor Constantine Petrovich Pobedonostsev who instilled into him conservative fundamentals of autocracy, Orthodoxy and nationalism that were required to govern the Russian Empire. Pobedonostsev believed that all opposition to the government be ruthlessly crushed and viewed liberal ideas as constitutions and free press as a threat to the state. It was also Pobedonostsev that taught Alexander III to be anti-Semitic and view the Jewish community of the Empire as "Christ Killers". With the death of his brother, Alexander inherited more than just the title of Tsarevich. While on his deathbed, his brother Nicholas insisted that he also take his fiancÚe. In October 1866 Alexander married the Danish Princess Dagmar. After her conversion to Orthodoxy, she took the name of Marie Fedorovna. Together, Alexander III and Empress Marie had five children. Their first child, Nicholas, was born in 1868 and would be the last Tsar of Russia. Their second child, George, was born in 1871 followed by Xenia (1871), Michael (1878) and Olga (1882). George died at 27 of tuberculosis in 1899. Michael is sometimes considered 'Tsar for a day', as Nicholas abdicated in his favor in 1917 before he, too, renounced the throne. The Bolsheviks murdered Michael six days before Nicholas and his family in July 1918. Xenia and Olga were able to escape Russia along with their mother during the Revolution. The reign of Alexander III began in tragedy. On March 1, 1881, on the eve of the signing into law Russia's first constitution, two assassins threw bombs at the Tsar's carriage in St. Petersburg. Alexander II was mortally wounded and died shortly thereafter. Russia's hopes for a constitution also died that day. One cannot fault Alexander's reaction to his father's death. His father, the Tsar Liberator, had freed the serfs, predating Lincoln's Emancipation Proclamation by two years. One can only imagine the rage he, his wife and children felt as they watched the Tsar bleed and die in a St Petersburg palace. This event would solidify the reactionary tone of his 13-year reign. As a result of the assassination, Alexander III would not consider granting the constitution. He tightened censorship of the press and sent thousands of revolutionaries to Siberia. In his Accession Manifesto, he declared his intention to have "full faith in the justice and strength of the autocracy" that he had been entrusted with. Any liberal proposals in government were quickly dismissed. 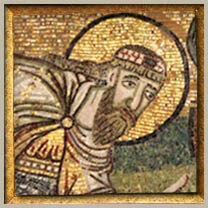 Alexander was determined to strengthen autocratic rule as a God given right. His reign is often referred to as the Age of Counter Reform. To many westerners he appeared crude and not overly intelligent. Queen Victoria commented that she thought him as "a sovereign whom she does not look upon as a gentlemen". Indeed, he was not educated or prepared in his youth to be Emperor. But what he lacked in style he more than made up for in his conviction of his position, his love for his country, and an understanding of the importance he could play in shaping his country's future. He possessed such a strong will as to rule the Russian Empire as absolute autocrat, to the point where the Empire stabilized and prospered, thus allowing capitalism to begin to take root. During his reign the autocracy stabilized and dissent was forced underground. He worked to strengthen and modernize Russia's armed forces while avoiding armed conflict and improve Russia's standing as a world power. To his credit, as a husband and a father he was greatly successful. He was also good with kids and doted upon his daughters. He dressed simply and would wear his clothes until they were threadbare. His simplicity was also evident in his choice of living quarters. Though he lived in the large Gachina Palace, he chose to live in the renovated servants area. He was known as "The Peasants Tsar", and because of his size was always viewed as larger than life. He loved the simplicity of Russian life and had little taste for anything western. In October 1888 the Imperial train derailed while the Tsar and his family were eating in the dining car. No one was seriously hurt, but the strong Alexander III lifted the roof of the car from the wreckage so that his family could escape. It was not known at the time, but the Tsar had suffered a severe bruise to his kidney that would contribute to his death 6 years later. 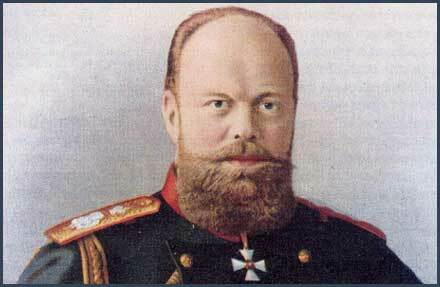 At the beginning of 1894 Alexander III was 49 years old. It was believed that he had, barring assassination, many years left to his reign. As the year progressed, his health deteriorated at an alarming rate. The best doctors of the time were called to help, but none were able to save the dying Emperor. Alexander Alexandrovich Romanov, Tsar of all the Russia's, died of Nephritis on October 20, 1894 (OS) at the summer palace at Livadia in the Crimea. He was buried in the St. Peter & Paul Cathedral in St Petersburg, the last Tsar be so. He left behind an incomplete legacy, his work unfinished, and an heir unprepared to rule. History tends to view Alexander III as a brutish despot. His only accomplishment being to strengthen his autocratic rule at the expense of the working class and peasantry. To his credit he stabilized the Russian government and maintained peace with his European and Asian neighbors. History is blessed with perfect hindsight. Alexander III, however, had no such luxury. He had no idea that the causes he cared for and the means at which he obtained them would cause the eventual destruction of the way of life and government he cherished so deeply. His canceling of the planned constitution set into motion events that would eventually take Russia to the brink of annihilation. The Tsar's inability or unwillingness to prepare his son Nicholas at an early age to rule as absolute autocrat further exacerbated the future events that would sweep over his Empire. Finally, Alexander was hopelessly out of touch with the emerging realities of a modern industrialized Russia. Autocratic rule was established at a time in Russian history when the nation was illiterate, uneducated, and attacked from foreign powers on all sides. That time was no more. At a time when the Russian government should have begun adjusting itself to the changing realities of the 19th Century, Alexander instead clung to and strengthened the autocracy. This is his greatest failure. He was a loving father and devoted husband. There is no doubt that he loved his country and fully expected to answer to God as to his accountability as Tsar. History has made its judgement. Should we ever presume to know God's? .